A little over two weeks ago, I started a SNAP Challenge for fourteen weeks. During this challenge I have to live off of a food budget of $30 per week (the average food stamp benefits a person gets here in the US). I am calling it Project Table for One, and you can follow my blog here if you are interested. 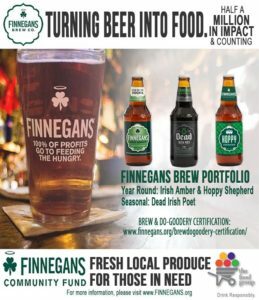 For this project I am teaming up with FINNEGANS to help raise $2,500 to help fight hunger right here is the Twin Cities. 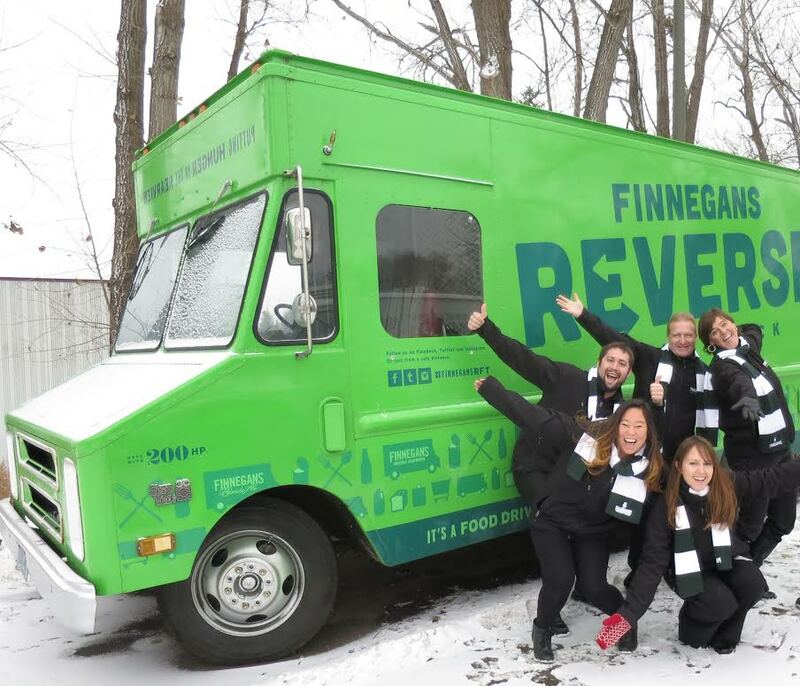 I got to sit down and talk to the Patty Morrissey of FINNEGANS to talk about her organization! Can you tell us a little bit about the mission of FINNEGANS? How was FINNEGANS founded, and who came up with the idea of a non-profit brewery? Our rambunctious entrepreneur and CEO, Jacquie Berglund, is the brilliance behind it. Jacquie was a local grad of Augsburg College with a degree in Communications and Political Science. She spent time furthering her studies in France and working with the Organisation for Economic Co-operation and Development, which consisted of many member countries who were trying to develop regional economies in the Baltic States, just after the fall of the Soviet Union. Her path took her back to Minneapolis and a re-connection with her friend and prior co-worker, Kieran Folliard of the Cara Pubs fame (Kierans Irish Pub, The Local, The Liffey, and Cooper.) Jacquie became the Marketing Director for Kieran. Together they created the idea for a beer, did lots of research on the right style and flavor, and launched Kieran’s Irish Ale. It was an instant hit. Meanwhile, Jacquie attended a conference and heard Billy Shore of Share Our Strength speak about using a for-profit model to fund a non-profit business. Since Jacquie was leading Kieran’s giving programs, and giving away far too much money, she and Kieran agreed Jacquie really needed to take this beer and run with it, satisfying her intense need to help others. Kieran sold her the beer for $1. She wanted to create great beer (done) and have a sustainable model (meaning you buy beer, we cover expenses and then we give 100% of profits to the hungry; rinse and repeat.) The name for her company was chosen in a many-pints brainstorming session with Kieran; FINNEGANS is a nod to the famous Irish writer James Joyce’s last work, Finnegan’s Wake. Its a fun read (this is a lie); you will laugh and cry (you will not finish it), you’ll thank me for suggesting it (this will be my last blog invite). Told you, Storyteller here. What are some of the programs you work with in the area? Our profits go to the FINNEGANS Community Fund. 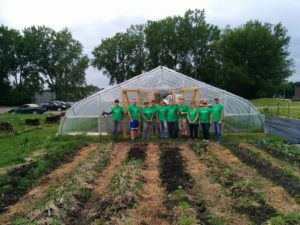 We work with Fruit and Veg Cape Town and The Food Group, a food bank here in the Twin Cities which uses those funds to buy fresh organic produce from local farmers in our Harvest for the Hungry program. We are so pleased to be focusing on fresh produce as our contribution to helping fill the food shelves and provide that healthy component to meals for those who need help. All of our donations that come in through events go back to the communities where they were raised, whether here in Minnesota or in the surrounding states. We have a very lively group of volunteers that drive our events, from beer fests, to the Irish Fair, Happy Hour squared (making sandwiches so Allan Law, aka “The Sandwich Guy”, can deliver them every night to people living on the street), Community Action Nights packing food, Chef cook-offs, bike races like the MS150 (we need about 80 more riders to reach our goal of 200 this year), and our annual St. Patrick’s Day pub crawls. What are some of the biggest wins so far for your community programs? Providing 100,000# of fresh produce in a year to feed the hungry is particularly satisfying. About 1 in 10 people in our area are hungry, and the majority of these are families with children. People being served by the food shelves are often working 1-2 jobs but may have challenges paying for all the needs of daily life, including child care. Sometimes one crisis can make it necessary for a family to count on a food shelf to get through to stability again. But seniors on fixed incomes, veterans, and college students are also a significant portion of visitors to food shelves. What are some of the challenges you face that other breweries don’t? We don’t have a tap room nor own a brewery. Summit has done a great job as our contract brewer for several years. The craft brew industry here in Minnesota has exploded since Jacquie first started FINNEGANS 16 years ago. We’ve seen growth from about 10 craft brewers to 120 or so. We count on our excellent distributor partners in the 5 states where FINNEGANS is sold to carry the beer – MN, WI, IA, ND, and SD. And our retail partners including bars, restaurants, and liquor stores are our lifeblood in helping us turn beer in to food. 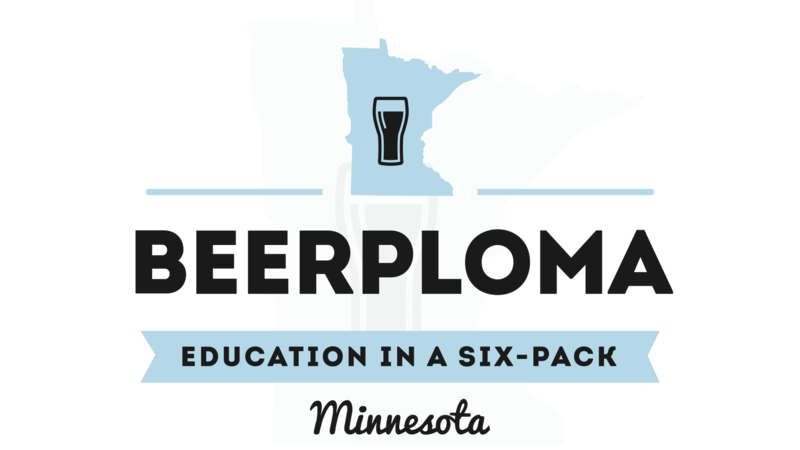 In spite of a very vibrant craft brew environment, we are the #10 beer in MN and #1 craft brewer without a tap room. 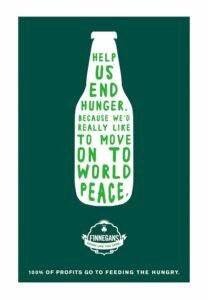 What is your favorite part of working for/with FINNEGANS? Fun company, fun events, the best and most noticeable marketing ever, and all for a good cause. Martin Williams does all of our marketing and branding, pro bono. An aside, Bono lives in Dublin and I personally delivered a written invitation for he and the owner of the Finnegan’s bar there to attend the opening of our new Brewtel in 2017. This bar has no connection to our company, but Jacquie sought out the bar and the owner on a trip to Ireland and they have become fast friends. This is an inside scoop for your readers. You’re welcome! The hardest part is just getting the word out about our great beer with a full time staff of only 4, a part time staff of 2, and about 6 Finnterns at any given time. We have a killer line up of beers with some very unique profiles in the marketplace. Our flagship Irish Amber is a full-flavored, medium body ale with a creamy, malty finish. It fills your soul with deep rooted goodness that can’t be filtered out by your liver. 20 IBU, 4.75% ABV. Dead Irish Poet is dark and broody like James Joyce, but more liquidy. 38 IBU, 7% ABV. Made in the 1910 Cork-style stout, it pairs well with blue cheese, steak, short ribs, and dessert, with notes of espresso and chocolate. Jester hops are rare in the U.S. – and they, along with Citra hops, are featured in our newest brew, Hoppy Shepherd. It’s hop-forward with an IBU of 50, but it won’t slap you in the face with hops, unless you’re really asking for it. ABV of 4.6%. And COMING MAY 12TH at our release party at Le Town Talk, to which all of your readers are invited, is our new Freckled Rooster. Berets optional. This Biere Blanc is going to blow you away. The hops are a tongue twister – French Strisselspalt and German Hallertau Blanc – they really get your mouth involved with tight bubbles and a dry, spritzy feel with notes of melon, stone fruit, and Sauvignon Blanc. Not to be missed! Tell us a little bit about the Reverse Food Truck and what that is about? Craft brew events often feature a food truck. Martin Williams came up with the idea of a Reverse Food Truck – you don’t take away food, you bring non-perishable food or cash donations to it. So, your organization has an event and you invite the Reverse Food Truck to be part of it. It’s really a rolling billboard to draw attention to the need to help the hungry. You know how puppies draw a crowd? Our RFT does that too, complete with the occasional puddle left on the pavement. Our first RFT is a 1983 Mac truck that served as a tool truck in its first life. Its aged a bit and really doesn’t like to run in the cold months much (who does?). Luckily, Thrivent Financial bought us another RFT a couple of years ago, and that one is spry and full of life, ready to come to any event, any time of year. In November 2015, Martin Williams and the RFT concept won the Hub Prize, a global competition for those who have created innovative brand experiences that change people’s lives. Any exciting future plans for FINNEGANS? Jacquie received a Bush Fellowship in 2014 – her project was to create an environment where innovators could work and meet, and build new social enterprises. As a result, we have plans to build a Brewtel in downtown Minneapolis, on the block that housed Kraus Anderson headquarters. The block will have a new Kraus Anderson headquarters, a brewery of our very own together with a hotel and restaurant, event space, and a FINNOVATION Lab where we can help new social enterprises get a start. This is a first of its kind concept that took a great deal of collaboration with partners and the community to pull it off. It also helps provide needed development in the Elliot Park neighborhood, just south of the new US Bank Stadium. Ground breaking happens soon, and we plan to be in our new space in December of 2017. Where can I find FINNEGANS? Many of your local liquor stores carry it in our 5 state distribution area. Ask for it when you go out to eat or when you visit a bar. Check out our website and click on the button “Find a FINNEGANS” for additional help. How can I help out/volunteer?So glad you asked! #1 – Buy our beer. We know you will love it. Plus you’ll be helping us turn beer into food. #2 – Ask for our beer in retail establishments you frequent. Retailers want to have the beer available that you want to drink. #3 – We need more volunteers to drive our events, which support our partners and grow FINNEGANS fans, who then drink our beer. At some of the events, we get paid a donation for each of the volunteers we bring to staff the events. Summer and fall are super busy – go to our web page at http://finnegans.org/events/ and find an event that sounds like fun. Grab some friends and be part of our crew! 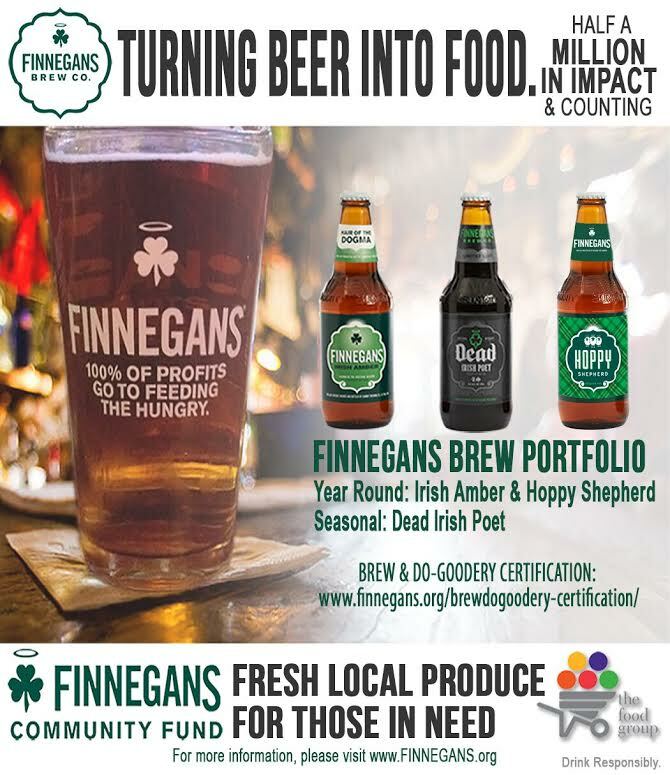 #4 – Make a donation to the FINNEGANS Community Fund – again, on our website. At times in life you’re too busy to volunteer; this is a way to still be involved. We will happily turn your dollars into food for the hungry. Help us do good! Cheers! Special thanks for the FINNEGANS Team and Patty Morrissey for taking the time our to have this interview with us! 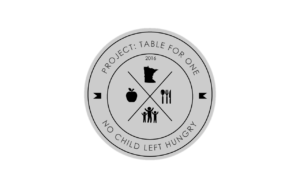 Don’t forget to check out Project Table for One, and if you are interested in helping to donate to our cause just click on the logo below! Thank you and PROST!